Place roll halves on work surface, cut sides up. Tear bread from top halves, leaving about a 1/2-inch shell. In small bowl, mix mayonnaise and pesto. Spread mixture on cut sides of roll halves. On roll bottoms, layer spinach, cheese, tomatoes and basil. Drizzle vinegar over basil, and replace roll tops. 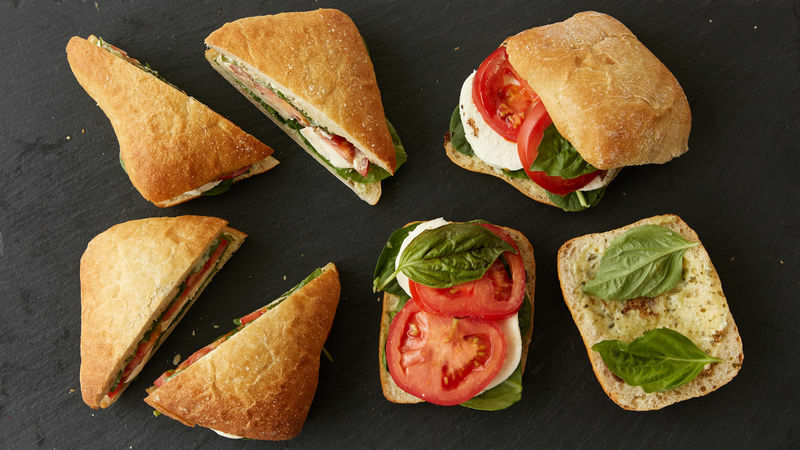 Cut each sandwich in half diagonally, and serve. These sandwiches can be made ahead, tightly wrapped and stored up to 2 hours in the refrigerator. The torn-out bread can be turned into bread crumbs. Tear into small pieces, and mix with 1 teaspoon oil in small bowl; spread on cookie sheet. Toast in 350°F oven 10 to 12 minutes, stirring occasionally, until golden brown. Cool, and store in airtight container.